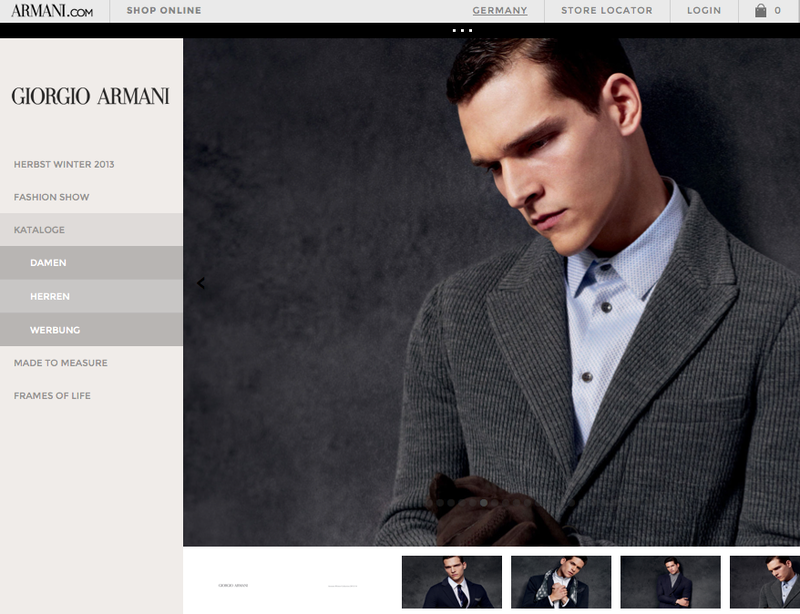 A long-overdue upgrade to the Armani.com website was just released in the last day or so, and it’s a good overhaul. The old site was long-in-the-tooth and quite tedious to navigate, but this one is fresh and contains a lot more interesting and easily accessible content; it looks like somebody at Armani has begun to sit up and take much more serious notice of the power of the internet to drive business. There are a lot of new features integrated, including the usual handful of social media links, very much more accessible catalogue and video content, and most important for me, a much improved store locator. The online store is more tightly integrated, again with more sophisticated graphics and video, but as usual the black label Giorgio Armani lines are not available on the internet. A very welcome change. Typically I’m a bigger fan of the Fall/Winter styles, but this is a knockout Giorgio Armani collection for next summer. Numerous excellent, soft jackets, some with really outstanding lapel details and interesting gorges; pants that derive gently from the sportier FW2013 collection, and most importantly models who look like they can wear these clothes properly in the real world. There were even some shoes I really liked, which is unusual. Sometimes when you talk to Giorgio Armani boutique staff they will discuss which collections have been strong or weak sellers, but I can already see that SS2014 will be a popular direction, and I’ll personally be picking up several of these items. Awesome collection. The recent Christopher Kane SS2014 collection reminded me that I was planning to write something about this up-and-coming designer and his ascent to the echelons of fashion stardom. It’s a little bit off my regular beat, but I like the brand and the story, so I hope my regular readers will bear with me; I do have some new Armani updates coming from Dusseldorf, Moscow, Barberino and Dubai in a little while. 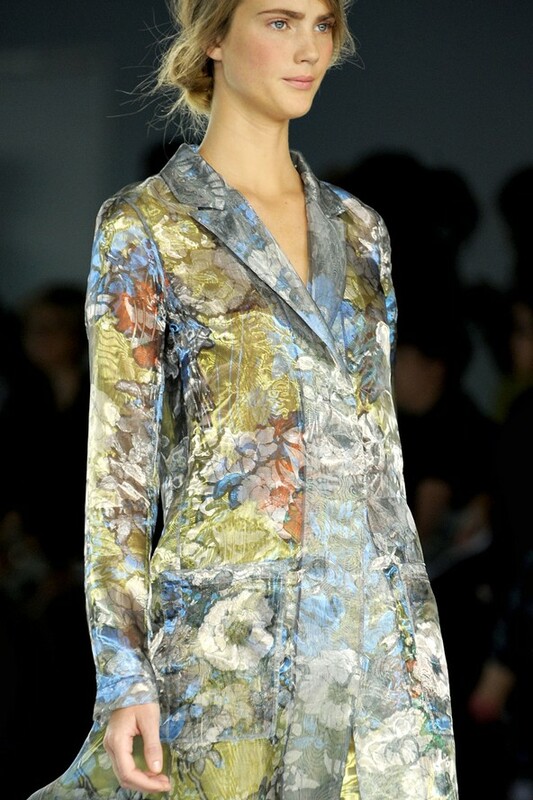 I first noticed Christopher Kane about a year-and-a-half ago, while surfing through some collections from the 2011 winter shows for the following summer. 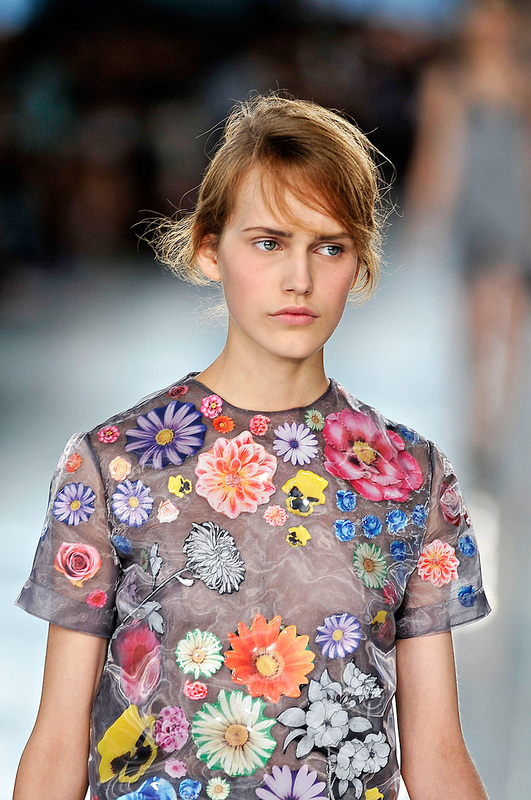 I was struck by a couple of the tops and coats from his SS2012 collection, containing flowery prints and sheer greys – and even more impressively my wife actually asked me “who made those?” when she saw them on the screen. I kept the name in the back of my head since then, and watched for the next collections. 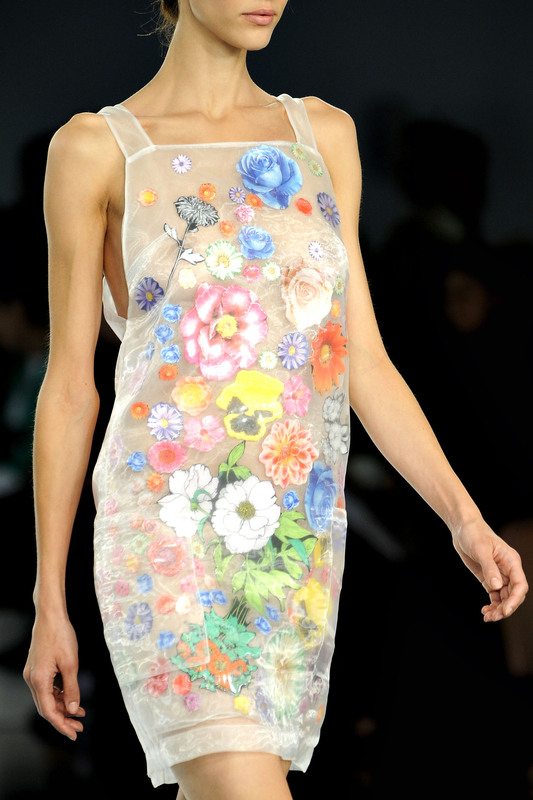 Christopher Kane is pretty good at making strong, attention-grabbing collections. His first outing post Central St. Martins MA, in 2006, was a semi-famous neon / bandage collection which sparked a wildfire of highlighter fluorescent colours the following summer season, making the fashion press sit up and pay attention like an energetic Yorkshire terrier. A fair amount of media and critical acclaim followed over subsequent seasons, for ideas as diverse as gorilla prints and slinky, flouncing, prehistoric scales. Various starlets found themselves photographed in Kane creations, raising his profile with each passing season, collaborations with Versace and prestigious awards followed, and the combination of increasing fame and pretty, eye-catching garments drove sell-out sales. That kind of repeated, sustained attention-grabbing fashion sense – plus a more important ability to transmute those elements in to wearable, high value, desirable clothes – is what spins a nascent, interesting, but small-time brand into something investable. In 2011 Christopher Kane Limited (CKL, the corporate vehicle) was turning over less than five million GBP per annum; this is revealed from the fact they did not need to file full accounts in the UK for 2011, and various other clues in the abbreviated accounts. That looks small until you put it into the context of other well established brands like Westwood or Hamnett or Temperley, who are turning over sums that aren’t orders of magnitude removed from CKL’s results. But the potential was clearly there to scale that brand into a fashion rocketship, providing somebody could bankroll the growth into boutiques, new markets, new products and so on. And it was therefore not much of a surprise when Kering (formerly PPR, owner of Gucci etc., run by Francois Pinault and now his son) took a large stake in the company earlier this year. As always with large companies investing in smaller ones, it’s slightly more complicated than simply buying a chunk of equity on equal terms; there are a bunch of exit rights, director rights and two classes of shares, which will be important as time passes. The valuation number can also be easily guessed at by reading between the lines of Kering’s financial statements (pages 11 and 69). But all those things are typical in any kind of investment like this, and broadly speaking this is a good, strong long-term luxury invester who brings capital, a massive distribution channel and skilled manpower such as Alexis Babeau, managing director of Kering’s luxury division and new CEO Alexandre de Brettes to the mix. Kering, Christopher Kane and also, importantly, his sister and equal business partner Tammy Kane, should profit handsomely from the investment over the coming years as the brand rises to the upper financial reaches of the fashion hierarchy – perhaps not to the multi-billion dollar empire of Giorgio Armani, but to a pretty comfortable seat at the global table. Despite a pretty tight work schedule in Shanghai last week, I had a couple of hours (and a central location) that gave me the opportunity to check out not just one, but two Giorgio Armani boutiques: the original flagship store situated directly on Shanghai’s famous Bund, and the one located within the very upmarket Plaza 66 skyscraper on Nanjing Road. In this post I will explore the 3 on the Bund location. Giorgio Armani opened this store back in 2004 (you can still find the press release online), as a way to shine the spotlight on the GA brand in China. 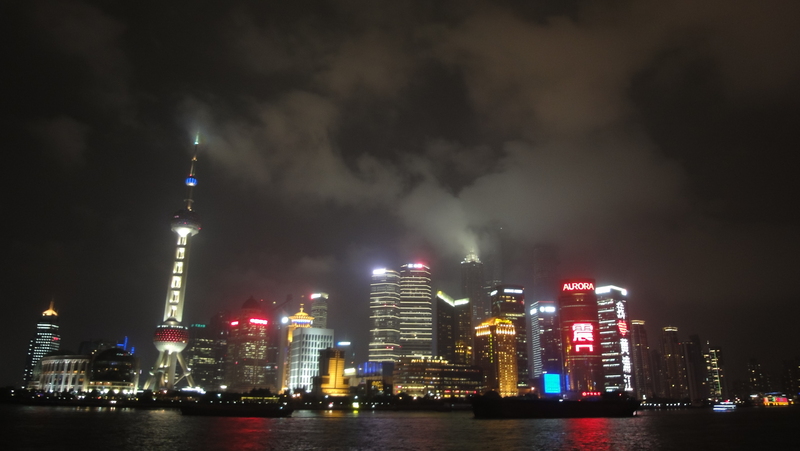 The Bund was – and still is – one of the most highly trafficked tourist areas in Shanghai, both for Chinese and foreign tourists, and it seems that the position was selected mainly to ensure the Giorgio Armani name was suitably prominent. Many other luxury brands such as Cartier followed suit. The Bund, however, was never considered a prime retail location; rather more of a branding exercise, with large crowds browsing but rarely buying. Piaget’s chief executive Philippe Leopold-Metzger summed it up nicely: “Locals don’t go to the Bund to buy luxury goods, and those that go to the Bund don’t buy luxury products.” If you walk around that area in the evening, you can see the truth in that statement. There’s an amazing and atmospheric view of the Pudong skyline across the river, but the Bund is more about tourist sight-seeing than high-end shopping. That dynamic has had a natural impact on the Bund, as other areas of Shanghai such as Jing’an have become more important as serious, affluent retail locations. The staggeringly huge and opulent Plaza 66, which I will cover tomorrow, is in the centre of Jing’an on the Nanjing Road, and you can see why those who shop for Gucci, Prada, Vuitton, Armani and Versace would prefer to spend time and money at such exclusive and elegant locations. The result is a migration of premium brands away from the Bund in recent years. Like many things on the Bund, such as the slightly down-at-heel Waldorf Astoria just next door, this area has lost some of its sheen, and the luxury brands have moved on to more fashionable addresses. The GA Bund store actually closed it’s doors earlier this year, and the ground floor of it’s former address, 3 on the Bund, is now just an empty shell. There are still signs that this was once a Giorgio Armani flagship store; on the windows you can see the shadows of the branding manifestations, the name plate inside the building lift features “Giorgio Armani”, and inside the store you can still see the remains of the decor – the mirrors, spotlights and rolled white linear wall coverings that pre-date the current warm beige stone. By pure fluke, I managed to be the last person to see the GA name plate within the building; I visited the store one rainy evening last week, taking a few snapshots, and by the very next day most of the branding was gone, because the old GA store had been turned onto a new Shanghai bar literally overnight. I personally watched the workmen moving the equipment in on Wednesday (you can see some of them inside the old store in the internal photo above), and by Thursday evening the bar was up and running in full swing. Inside there was still the old decor, even the changing rooms, hidden behind scaffolds of spotlights and a complete bar constructed in under 24 hours. 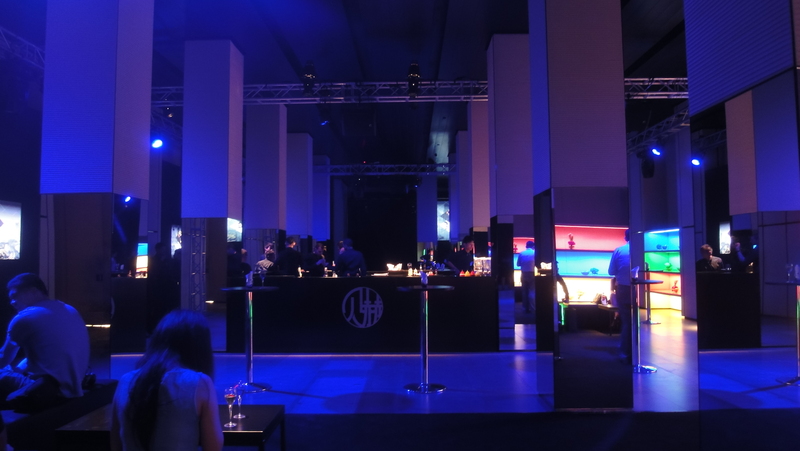 It’s slightly sad to see what was once deemed to be the epicentre of Shanghai style turned into a hastily assembled cocktail bar, but on the other hand you can sense that this area no longer fits the brand. Tomorrow we’ll visit the impressive Plaza 66 skyscraper, and see where the Shanghainese shop for Armani nowadays. My work sometimes takes me to quite interesting, far-flung, even exotic places, like Rio de Janiero in Brazil, Dhaka in Bangladesh, or as this past week, Shanghai in China. Shanghai is one of the most incredible destinations, full of vigour and bounce, and it’s also one of Asia’s most energetic and fast-moving fashion hubs. 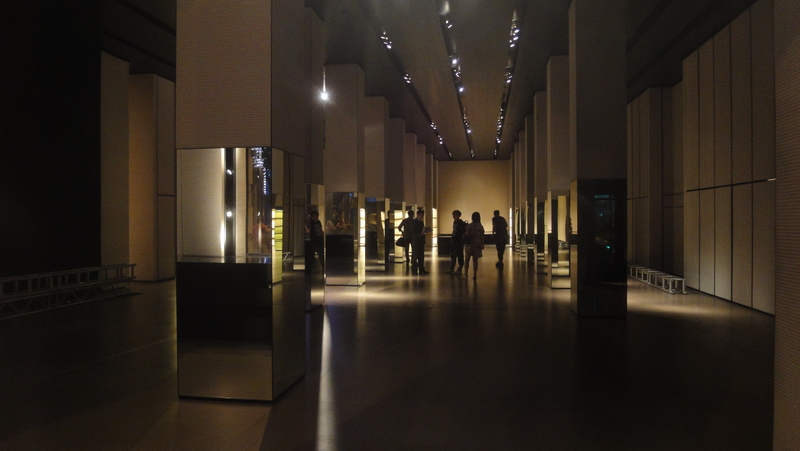 I hope to have enough time to visit two Giorgio Armani boutiques during this trip, as well as some of the other high end stores, and prove those points by exploring the way the face of Shanghai fashion has changed over the past decade. It is often said that the luxury industry is immune from recession; the wealthy will keep shopping no matter what the macroeconomic environment. And there is some truth to that – not complete, but a strong element. Recent newspaper reports are rife with big upticks for the major brands, despite continuing global economic woe. As witness I present to you a couple of recent developments in downtown Munich. 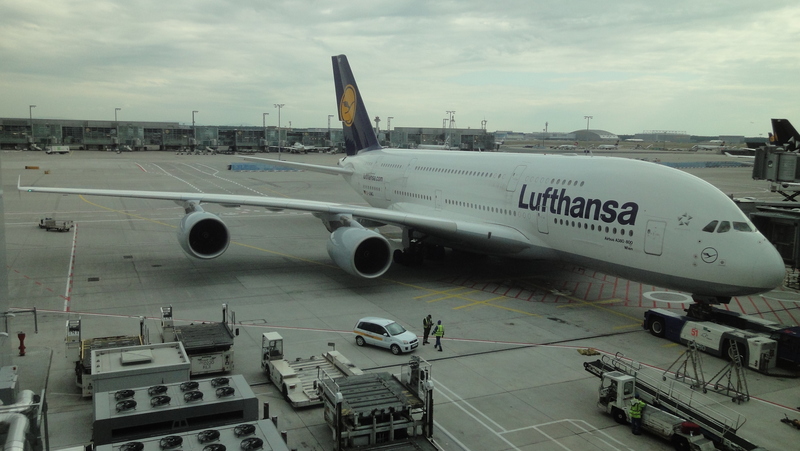 It’s well understood locally that Munich itself is almost recession-proof; economic downturns seem to skirt past this city, which is fundamentally very wealthy and enjoys a tax-base supported by successful local family-run businesses – like BMW. 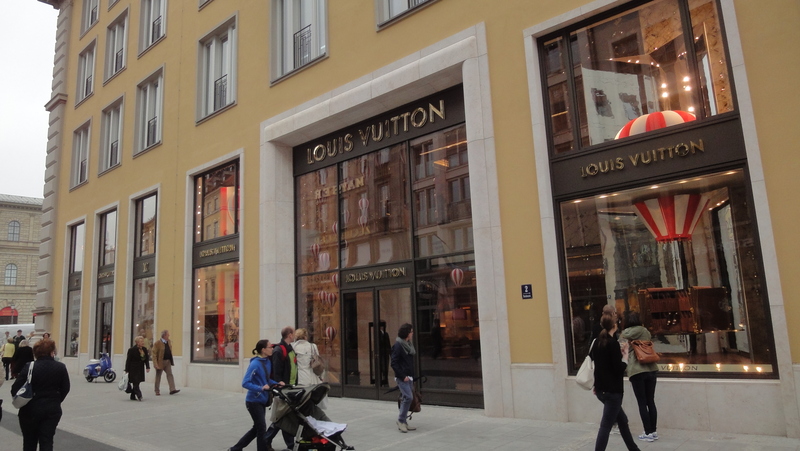 Firing the starting gun for expansion is Louis Vuitton, moving from a smaller store on Maximilianstrasse to a massive new “maison” nearby, the Residenzpost, in the heart of historic Munich. This location used to be just slightly more utilitarian – it was a Deutsche Post office until a couple of years ago, before the entire block underwent a very expensive renovation/gentrification. This store is now a world-class LVMH expansion, with three enormous floors featuring pretty much every LV product known to mankind. There is even an LV promo video for the new store. And even at 10:05 AM on a Monday morning there were quite a few people shopping. This move changes the dynamic of the nearby shopping district immensely. Perhaps not by coincidence, Prada, situated literally just across the street, has decided the time to expand is exactly now, and I would not be surprised to see a few other expansions, refurbishments or relocations in the near future. Belstaff (which is, in my opinion, one of the most unlikely luxury brands ever; when I was young Belstaff was what bikers bought when they couldn’t afford leathers) already opened a brand new store nearby. But beyond the local environment, this is a telltale of the continuing global success of luxury brands, even the smaller ones in the PPR Group (now called Kering) like Stella McCartney and newly acquired Christopher Kane, about whom I will write a dedicated story later, and Giorgio Armani is no exception. Globally the tide is lifting all luxury brands. When will it end? It’s been a while since I visited Giorgio Armani in Munich (more about what is happening in Munich in the next blog entry), but today I got a couple of surprises. 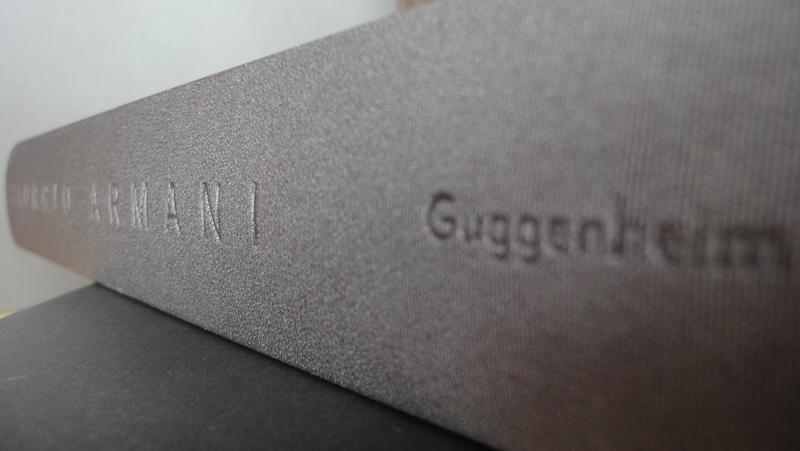 Not only did they recognize me by name, and comment in detail on this blog, but they also gave me an excellent present: the Guggenheim Museum’s huge, hardback history of Giorgio Armani, which is pretty much the bible on all things Armani. Many thanks to Karim at GA Munich for this thoughtful and useful gift; I’ve already spotted some great quotations in there and an interesting discussion on one of the most famous and widely imitated Armani innovations – deconstruction.